Nadalia is a child of dark, one of the abyss spawn, a compounded quintessence of Manus and his Dark Soul. Like her sisters; Nashandra, Elana and Alsanna, Nadalia is a fragment of Manus’ emotions. She represents solitude and loneliness. Also like her sisters, Nadalia travelled from a foreign land in search of a King. She came to the land of the Old Iron King, but arrived too late, the King had already been killed and his castle subsumed by flame. Having forsaken her flesh, Nadalia’s smoke enticed people to the Tower and it became known as Brume Tower which means “mist or fog”. Perhaps opportunists saw the tower’s smoke and presumed it was burning or had fallen, making it a beacon to the brave adventurers seeking to tap the replete stores of iron. But upon arriving at Brume Tower, all but the most steadfast were defeated, and their corpses were reanimated by the black fog, or left as ashen husks. The black fog of the tower brought the tower to life. 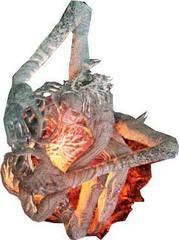 Its statues became possessed and attacked any intruder, the soldiers of the Old Iron King were resurrected as defenders and the Ashen Idols began to appear. The Ashen Idols were statues made of ash. 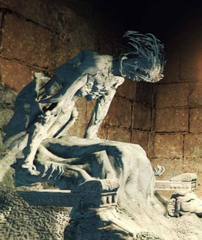 Nadalia, having renounced her flesh, entrusted her soul to these statues and it was through them that she was able to defend the tower. Approach of these statues yields different results, some fill the area with pillars of black fire, enhance the strength of the defenders and some heal the defenders. The Idols resemble Nadalia, but often have 4 or more arms. They can only be destroyed by driving a smelter wedge into the heart, a process that splits the Soul of Nadalia from the Ashen Idol. It is interesting to note that the wedges are made of smeltered iron, as if the only means to the Bride of Ash’s heart was found in the iron the Old Iron King was so notorious for. After some time it seems, a knight of Drangleic called Raime came to the tower. Raime was one of King Vendrick’s most trusted and powerful knights. He is described as an agile swordsman, who after his defeat at the hands of Velstadt, resigned his post and was considered a traitor. Raime came to Brume Tower in search of greater strength. When he arrived at the tower, he became infatuated with Nadalia, the Bride of Ash. Instead of choosing to expunge her from the tower as he could have done (most likely by destroying her Ashen Idols as we do), Raime chose to live alongside Nadalia and support her efforts. He became her champion of the Dark. It may have been that when he left Vendrick, Raime sought greater strength in which to defeat Velstadt, but upon becoming infatuated with Nadalia, he found a new purpose in life. What Nadalia’s purpose is in the tower is unclear. It seems that the Sisters of Dark all seek power, and try to gather as many souls as possible. Alsanna may be an exception to this, but we know that both Nashandra and Elana seek power. Nashandra seeks the great soul that is strong enough to power the Throne of Want and Elana gathers souls in anticipation of revenge. Nadalia too may have transfigured herself for the purpose of drawing those with powerful souls to the tower, in hopes of collecting those souls. Alternatively, Nadalia is known as the augur of solitude, and perhaps she simply sought to be alone, which is a theory that does not account for the presence of Raime. Or perhaps Nadalia awaits her King and more specifically the Old Iron King. When we first destroy an Ashen Idol we hear some dialogue from Nadalia indicating that she may have us confused with the Old Iron King. To gain access to Brume Tower, one must defeat the Old Iron King so it may be that Nadalia senses that soul upon us or that we have gained it at some point and believes us to be the Old Iron King. But whatever the case, we are told that Nadalia condemned herself to a fate most wretched. Nadalia burned herself to link the flame. A Pyromancy of Nadalia, Bride of Ash. Spouts multiple Dark Flames. This Child of Dark, bearing inconceivable strength, found herself in a kingless land devoid of souls. And in journeying there, has all but condemned herself to a fate most wretched. It makes little sense that she would purposefully condemn herself to a fate much worse than her solitude, unless of course there was a greater purpose behind it all. 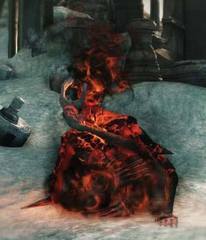 There are two reasons why Nadalia burned herself alive, and you may find that Nadalia’s suicide was much more selfless than originally thought. Firstly, it was an attempt to ease her pain and suffering in solitude, and secondly, to link the fire and advance the decaying land into the next age of prosperity. This may sound like a stretch no? Well tell me, what is required to link the flame. A great many souls, a kiln, a curse ridden land and as Vendrick implies perhaps even the crowns of kings long ago. I have already established that Nadalia possessed inconceivable strength? When we find her, is she not sitting on a throne surrounded by ash in what is very similar in appearance to the kiln under Drangleic castle. Does she not grasp the crown of the old iron king? Is it not about time for the age to turn since the land is devoid of souls? There are too many common factors to discard the possibility my friend. After taking the place of an undead and linking the flame she became a bride to no king, but ash. For once, instead of iron, souls flowed from the top of Brume tower, re-invigourating the world with life and starting a new cycle, founded on the sacrifice of an unknown saint whom no-one would ever love or acknowledge. It was unbearable, my dear. Oh, it doesn't matter. As long as you're here. I have a champion of the Dark. It's you who have lost. My dear sisters will come.